I never sang in public until I was 28, and had almost no training. So the professional singing I did was quite an adventure! Blues was what I loved the most and sang the best. When the bar scene got old, I wrote myself a little play so I could sing my own songs and the jazz standards I loved, without the smoky air and beery floors. (See Looking-Glass Love Songs) When invited to sing black gospel songs in the Rance Majestic Choir, I gave it a try, and stayed for eight years. We sang in prisons, in the Bahamas, in the Guthrie’s Gospel at Colonus, and once backed Michael Bolton. In other words, I had a ball and learned a ton, not to mention the friendships I found and still treasure. I don’t practice like I used to, so now I call myself a wabi sabi singer. That’s a wonderful ancient Japanese concept – appreciating the art of imperfection! Though I still feel like a rookie, I have been blessed to work with some wonderful musicians who have mentored me in writing and performing. So I’ll offer bits here, and hope a line or a melody might make you smile, or weep, or ponder…and enjoy. 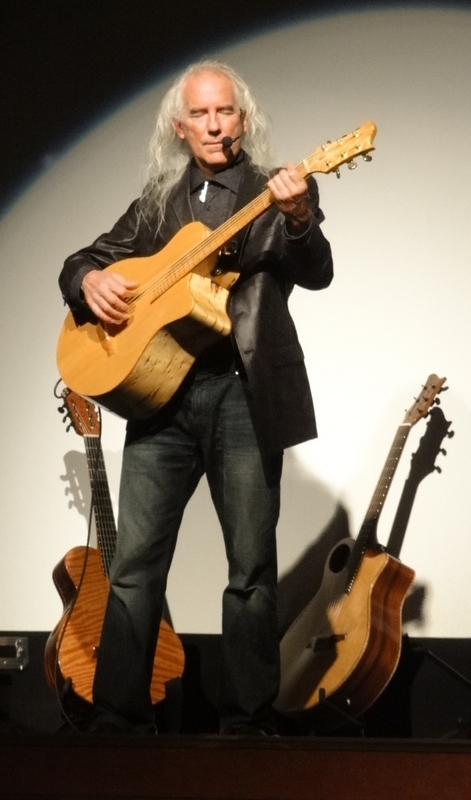 I love “The Quilter” both as a song and as Michael sings it (with lovely instrumentation). Reminds me of something Michael Johnson, Greg Brown, and Bill Staines might do. Terrific! 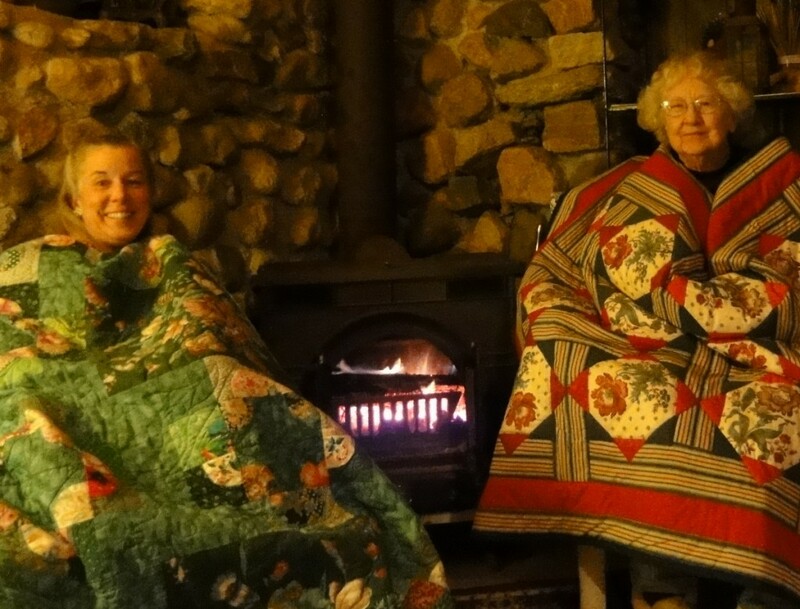 I also take great delight in the photo of you and “the quilter” sitting in your basement by the fire, both wrapped up in her magnificent creations. I know this is just one of many songs that you’ve written (like your mother’s quilts), but it’s a great one for this site. Thanks, Bill. Glad you like it. You’ve known me and Mom such a long time! I’ll post the slide show with lots of her quilts soon- when I figure out how to make the file smaller. Love the quilting story Hollie. I remember you at the lake singing as you swam. Thanks, Deb! That makes me smile! I’m on a different lake now, but I still love to sing and swim. I made a video to go with that song, full of Mom’s quilts – I’ll have to post it. We have known eachother all our life yet I realize I didn’t know you at all! Sad, but then I did live in Idaho 40 years. I would love to hear you sing!!! I have been trying to learn to sing for a couple years and have found that I have really fun and rewarding times finally sounding good after recording tapes, over and over . My tape recorder is not good but sometimes I can sound really good. I like Neil Young, Joan Baez, Sarah McGlacklan Crosby, Stills Nash and Young, and to my suprise, I sing well with Adam Lambert. Your life has been amazing! So true, Marilyn. We grew up cousins, but each went off on our own adventures. I’m glad to hear you are enjoying singing. Tape recorders help, but my favorite place to learn was in an old abandoned silo! Do you have any of those around? The acoustics are great for hearing yourself! No silos that I know of 🙂 I don’t even know what equiptment to use and if I did I wouldn’t know how to use it! I hope your Mom is well.